Exactly what defines the term "country vet" is nebulous, but James Herriot comes to mind, and so does Doc Tallamy. When one comes across an extra-ordinary person, including a self-proclaimed country vet, you just know, and it's often difficult to fit others into that mold, if there is one. Many veterinarians live and work in northwest Jersey's farm country, but few are solo practitioners working from home without the assistance of other vets or technicians, venturing where they must to serve their paying and non-paying clients and patients. "Compassionate, altruistic, public-spirited, family" seem to describe this breed of veterinarian/humanitarian at work. They exist, but are on the Endangered Species List. Doc worms a goat with Louise's help while family looks on. Paul Tallamy, DVM, PhD, checks his Chevy Tahoe for all the right tools as he begins his workday as country vet. His mobile clinic, complete with wooden compartments and drawers custom built by his sons, holds all the gear he needs to serve his clients well. First stop: Wykertown, where Cat Cat's hyperthyroid condition has brought her down to skin and bones. Doc Tallamy gives owner Louise gel to apply to Cat Cat's skin. It will shut down the thyroid enough so her elevated heart rate doesn't burn off every calorie she eats. In the barn Doc inspects a female South African Boar goat with sores on her back. The goat's wounds probably came from an abrasion that caused mange, he says, with secondary infections of mites and fungus. Doc recommends Louise buy tea tree oil to dry up the wounds and provides her with anti-parasitic ointment. Tea tree oil? Tallamy accepts holistic medicine when it's prudent to use it. He knows that all modalities needn't be out of a bottle. Some remedies in the natural world and at home, like putting on ice, are suitable answers. "Is it homeopathic or just common sense?" he asks. Doc startles the calf to get her off her feet and moving out of the shoot. On to Arrowwood Farm, home to eighty animals on thirty-five acres in Upper Saddle River, where Doc sees a female calf and miniature horse who are about to move to a Long Island petting zoo. He gathers tools from his mobile clinic for the calf: dehorner, vaccination and tattoo gun. 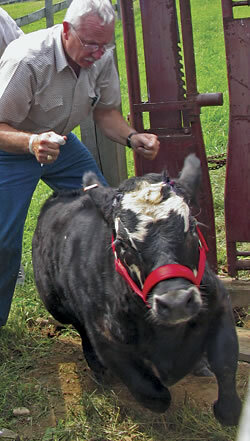 Alan, the manager, chases the calf into the chute to get her head placed in the headgate so she can be tied securely. The chute hasn't been used for years. Doc pounds the iron headgate loose with a hammer and instructs Alan to cover a hole so the calf doesn't lose footing. The goats, released from their pasture, come bleating over to see what's the matter, and daddy bull moans loudly from the pasture above. The calf moos "Nooo," taunting the bull, as Alan pushes her from behind till her head sticks through the gate. He quickly halters her. Doc says the bull is being protective: "He wants to get down here and see what's going on and maybe more than that. He's interested in being the herd sire!" Meanwhile, the dehorning iron heats up. 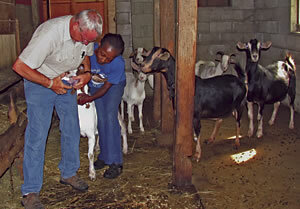 Doc vaccinates the calf against Brucellosis, a parasitic disease. He tattoos her right ear and tags it as proof of vaccination, then burns off the stubs of both horns. Spent, the calf lays in the chute while she calms. Doc gives her fifteen minutes then startles her out of the chute, and she sallies over to a barn to rest. Next critter: a yearling miniature horse named Arrow's Classy Lady. Doc takes her blood for a Coggins test for Equine Infectious Anemia. A negative result is required for any horse to be transported across state lines. Tallamy covers four states to care for his two-thousand-plus patients. Besides large animals by day and small animals by evening, llamas in Shohola and farm animals in Bushkill and Westtown, he packs his days with good will, like at the alpaca farm at Fountain House, a self-help facility for people with mental illness. He even makes house calls for dogs. "It's the road we take: the fact that you're going to relieve pain and suffering for the animals," he says. "Half of my job is trying to educate people. Most people aren't stupid. They just don't have the knowledge that they're ignorant of a certain topic — like parasites. It's the job of a veterinarian." The drive to Upper Saddle River earned Doc about the same amount of money as a feline castration in the office. "So how do you measure self-worth and self-satisfaction?" he asks. "I want to be around my family." "I could have charged like an attorney. That's for the next generation to deal with. It's too late for me." Indeed. His daughter calls him a dinosaur. "One reason to have a clinic in my house is so we could have a family life. I didn't have to leave and go to the clinic because I'm already there," he says of his wife Alice, two sons and daughter. When asked what a "country vet" is, he says, "Doing what I do. When your clients become like an extended family and you know everything about them and you witness their children growing up and having their own pets and children second and third generation. It's the satisfaction and diversity to go out and work in cattle situations and turn right around and work on a horse and in a very short time, work on dogs and cats. If I don't know the answer, I don't go there. My main focus is not on economics. It's fulfilling a need in the rural community. It's a calling." Tallamy's lived in Sussex County most of his life, except for when he attended Texas A&M University where he earned both a Doctor of Veterinary of Medicine and a PhD in veterinary medical science/preventive medicine. He and his family came home to New Jersey in '79 and started the solitary practice with Alice as anesthesiologist. In those days they did a great dairy business. These days, small animals are sixty percent of Doc's business with beef and dairy filling the holes. Doc sees small critters at his home-based office with Alice still minding the phone. Sometimes clients bring goats, horses and cows to his house and Doc comes out in the driveway to check them over. "My interest is trying to help my clients and patients and provide quality care at an affordable level and to know when to refer animals. I know enough veterinarians around so I know where to send cows and horses and dogs." 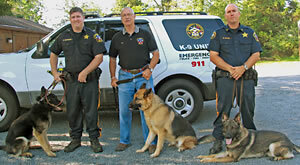 A Commissioned Peace Officer, Tallamy has been the Sussex County Farm and Horse Show/State Fair vet for over twenty-five years and the Sussex County Sheriff's Veterinary Medical Officer, K-9 Unit, for fifteen. "I'm not just a vet. I'm a many-faceted person too. I understand law enforcement. I understand what it is to ride the roads, too. It gives me professional insight. I understand the dogs." Kieran McMorrow with Atlas, Doc Tallamy with Blaze, Warren Slahor with Eggo. One morning, two Sheriff's Office K-9 Unit Emergency vehicles pull into Doc's driveway, and out step two Sussex County sheriff's officers and three dogs: Kieran McMorrow and his patrol dog, Atlas, currently in training for narcotics detection; and Warren Slahor with Eggo, explosives detection dog and member of the New Jersey Detect and Render Safe Task Force, and his boss's Search and Rescue dog, Blaze. The officers bring the dogs to Doc for routine care. Says Slahor: "We have one consulting veterinarian -- a specific person that knows these dogs from the day we get them to the day we have to put them down. He is the dog's personal doctor." K-9 Unit dogs work in a high energy, high stress, high stakes job. Searches are so intense that they work for just twelve to fifteen minutes at a time, with breaks in between and diminishing time frames. Officers must know their dogs and how to recognize a dog in trouble. Each unit has a canine emergency first aid pack, described by Doc, that includes medications, antidotes for poisoning, vaccinations, and aid for lacerations. But in an emergency, the officers can call Doc 24/7. He tells them what to do: fix the dog themselves, bring him in or take the dog elsewhere for specialty care. "It's the ability to recognize the problem and take care of it and recognize the problems we can't handle. We're the first line of defense and protection for these animals. We're sort of a family," says Tallamy. And that's important to these guys. Says McMorrow: "I have Doc speed-dialed into my phone in case there is an issue. Doc's fantastic. He takes calls any time of the night." Enter Karen Dashfield, DVM, of Fredon. It's hard to say how many clients she has—they come and go through shelters and rescues including wildlife sanctuaries, Hurricane Katrina, and your every day cat and dog with an occasional sheep or goat. She, too, claims no specialty. And though she has been practicing since '91, she has no office or regular routine. Working in a tent outside the Richards Building at the Sussex County Fairgrounds on Newton Kennel Club's Dog Show day, Dashfield changes out vials of blood in a centrifuge for testing. Here, as at several end-of-summer dog shows where she is show vet, she tests dogs to make sure they are healthy for breeding and gives vaccinations. This weekend she's the vet for four dog shows with two more weekends to go. A woman brings Spice, a Golden retriever, into the tent to have a heartworm-tick-borne disease test. Dashfield draws the blood but she'll mail it out to a lab. Just as Spice leaves, she answers her cell: "Vet on call!" Within minutes a woman enters to ask about hip X-rays and gets put on the list. Another wants meds for her vomiting dog. She says once her dog went into kidney failure, and Karen saved her. A teenage girl enters to ask about shots for two bull dogs tomorrow. The flow is nothing new to this vet who easily works seventy-hour weeks making house calls, solo, out of her mobile office. "You can learn so much when you do a house call: how the animal is kept in the house, what it eats, what the backyard looks like," she says. "The dogs are much more relaxed." Dashfield does clinics for organizations three or four times a year. At clinics, pet owners get group prices for genetic screening and other annual tests. "It encourages people to provide proper care and not cut corners where they might otherwise, especially in this economy right now," she says. She is active with animal shelters and rescue groups, particularly BARKS Animal Rescue in Byram. She is their vet and has also set up a pet food pantry, redistributing it to seven animal groups and eight human food pantries in Warren and Sussex Counties. Sometimes she delivers it to clients on her visits. 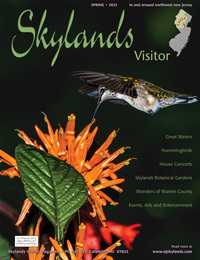 At Antler Ridge Wildlife Sanctuary, a 150-acre preserve in Frelinghuysen for injured wildlife, Dashfield provides intermediary care—sutures, IVs—before they are sent on to specialists. The rescue doesn't end in New Jersey. From Best Friends Animal Shelter in Utah, one of the largest animal sanctuaries in the country, Dashfield is selecting dogs to train for Search & Rescue and networking to find placement for them. And as if this were not enough, Dashfield is training her second dog, a Springer Spaniel named Sadie, in live wilderness and cadaver recovery. Sophie, her deceased German Shepherd, worked 9/11 disaster response at Fresh Kills Landfill on Staten Island searching for human remains. It brings people closure, she says, even finding people alive, like those with Alzheimer's who have wandered off and got lost. How does she do it all? "It's a constant juggle: working on Search & Rescue in wee hours; slipping in each day whatever I can fit in. It's keeping a balance in life. It allows me some freedom to work at the shelters, to be able to provide charity-type care and to have a purpose in life other than just going to work and bringing home money and paying the bills. There are more than enough people doing clinic practices so people can be referred to them for intensive care or a specialty. It's the challenge of never knowing what animal you're seeing next. Part of the fun and excitement is you can be involved in so many aspects of veterinary medicine." Ask Richard Alampi, executive director, New Jersey Veterinary Medical Association NJVMA) if any of the state's roughly 1,300 vets practice solo out of their homes with no technicians. "Anecdotally, slim and none," he says. "They're a dying breed." The idea of working 24/7, 52 weeks out of the year burns people out and people entering the profession don't have the same interest in working with large animals for several reasons: opportunities don't exist in large animal medicine like they used to and kids today cannot make the connection between the cow in the field and a McDonald's hamburger. "That whole disconnect societally, having roots in the soil and understanding agriculture, is gone." Circa 1920, 85% of the population worked in some aspect of the food industry. Now it is less than 1%. "Today's kids aren't exposed to and don't understand large animals. It's a foreign area; whereas, cats and dogs are familiar to them. Kids going into veterinary school today, that's what they know and are interested in." NJVMA has 1100 members, 95% of NJ's 650 practices and about 85% of vets. Roughly 60% of the members are self-employed with technicians and receptionists. Of the remaining 40%, most own practices with employed veterinarians. 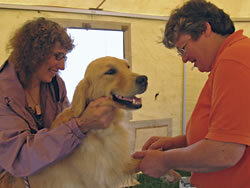 Mobile veterinarians are on the rise due somewhat to senior housing.